550 ✉ Federal Republic of Germany / BERLIN - rich collection from decorative covers and illustrated First Day Cover the issues prevention of accidents, as well castle and palace in the thick ring binder with many different issues, numerous se-tenant, stamp booklet panes, margin copies and so on. Enormous catalog value respectively acquisition price! 610 x Federal Republic of Germany / BERLIN - extensive lot packed in a carton, as well numerous souvenir sheets from Beethoven, many issues multiple, as well stamp booklet and many mint never hinged issues Berlin with numerous complete sets, with also corners of the sheet. Huge catalogue value! 920 /⊙ Federal Republic of Germany / BERLIN - nice collection Federal Republic of Germany 1968 / 94 mint never hinged complete in four SAFE hingeless albums, in addition to it many once again used, also many centered cancellations, as well a few extra, stamp booklet as well Berlin 1977 / 90 mint never hinged complete in the SAFE dual album, here, too, many once again used Michel approximate 4500,- €. All in five high-value SAFE-albums. Albums original price already over 600,- €. 937 GA Federal Republic of Germany / BERLIN - unused postal stationery in four ring binder and in two filing cabinets, all very clean from postage stamp impression Heuss, often with variety collected, reply cards, picture postcards, special postal stationeries, nice novelties part and so on. Within a ring binder find be used cards. Large number of pieces! 1133 x Federal Republic of Germany / BERLIN - extensive inventory packed in a carton with numerous issues on stock cards and in approval books, mainly mint never hinged material, as well numerous stamp booklet, blocks of four, many complete sets in mint never hinged condition and so on. Enormous catalog value, very favorable! 1157 Federal Republic of Germany / BERLIN - 1973 / 2000, complete collection the officially yearbooks with the mint never hinged issues from Federal Republic of Germany / Berlin and the black prints. Is included also the scarce issue of 1973 expertized Schlegel BPP. Very high purchase price! Michel 4465,- €. 1278 /⊙ Federal Republic of Germany / BERLIN - extensive collection in three thick Lighthouse-albums, as well Federal Republic of Germany with early issues from Lower House of German Parliament 1949 mint never hinged, also welfare series, St. MaryÂ´s Church used as well the years 1960 / 84 over far parts complete, many is mint never hinged and once again used available. In addition to it extensive collection Berlin from 1958 here, too, many mint never hinged and used very high catalog value! 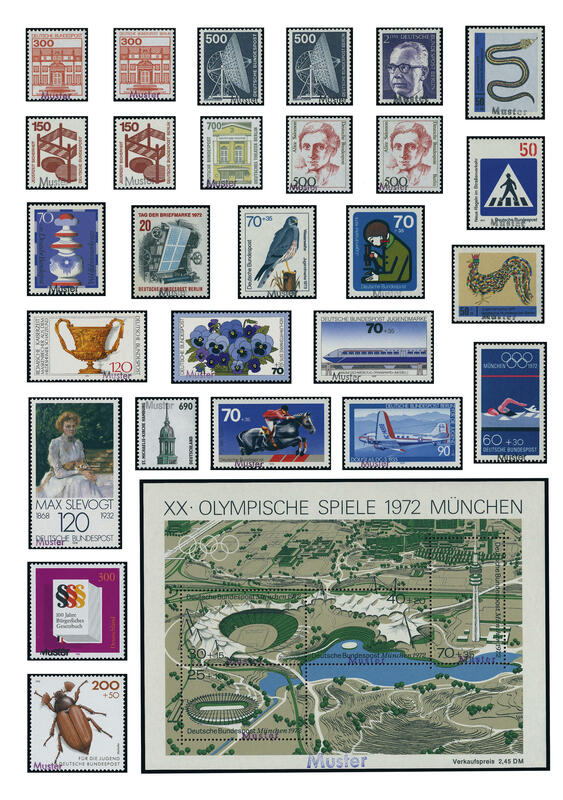 1409 Federal Republic of Germany / BERLIN - 1971 / 96, extensive mint never hinged collection from specimen stamps with a wealth complete sets and souvenir sheets, welfare and youth sets and so on. Including numerous favorite subjects, postage stamps sets and so on. In total includes the nice collection over 1400 stamps and 33 souvenir sheets. An extraordinary object! 1464 Federal Republic of Germany / BERLIN - extensive mint never hinged lot stamp booklet in the ring binder, with also Heuss watermark sideways, as well numerous further issues pending sights. Very high catalog value! 1604 x Federal Republic of Germany / BERLIN - extensive inventory souvenir sheets mint never hinged respectively used in a large stockbook, a box, as well a wood card box accommodated. As well numerous issues from Beethoven, often in larger numbers of pieces. Enormous catalog value! 1681 Federal Republic of Germany / BERLIN - extensive inventory from approximate 530 stamp booklet, predominantly Federal Republic of Germany, as well numerous issues castle and palace also further material including different types and so on. Treasure trove for specialists, unchecked for plate errors and so on. The booklet are unlabeled, special stamp booklets are not included. Treasure trove for specialists! 1798 /⊙ Federal Republic of Germany / BERLIN - huge inventory from margin copies and corners of the sheet the issues from the sixties years with margin color lines en masse thick stockbook accommodated, usually placed close to each other. An enormous amount of material. With also numerous welfare series, youth sets and so on. Mint never hinged respectively also lots of used material. In this richness hardly ever offered! 1853 /⊙ Federal Republic of Germany / BERLIN - enormously extensive inventory from souvenir sheets, mostly in larger numbers of pieces packed in a carton, all on stock cards mint never hinged respectively with first day special cancel. Lots of material and huge catalogue value! 1868 year kF Federal Republic of Germany / BERLIN - 1973 / 2000, complete collection the officially yearbooks with the mint never hinged issues, black prints and so on. As well the scarce issue of 1973 expertized Schlegel BPP with enclosed attest \"perfectly quality\" (issued only 10000 piece). Michel 4465,- €. 1907 /⊙/ Federal Republic of Germany / BERLIN - 1948 / 90, extensive collection in four printed form albums formed with plenty of better issues, frequently even in both conditions available. As well Federal Republic of Germany with Lower House of German Parliament 1949 twice, 100 years stamps twice, welfare 1949, Bach seals twice, Stephan twice, St. MaryÂ´s Church twice, Wuppertal series twice, welfare 1951, welfare 1952, transport exhibition 1953 twice, welfare 1953 twice, Heuss 1954 and further better issues, many complete volumes and so on. Furthermore Berlin likewise well-staffed including black overprint 1948, Stephan set, ERP 1950 twice, bell left twice, Day of the Postage Stamp 1951 twice, bell right twice, men 1952 twice, memorial church twice, bell middle twice, 70 Pfg. Green forest and so on. Favorable valued collection with enormous catalogue value! 2056 Federal Republic of Germany / BERLIN - extensive mint never hinged collection blocks of four from the sexagenarians, seventies and octogenarian years housed in two large stockbooks, usually placed close to each other with an enormous amount of material, numerous special- and commemorative sets, postage stamp issues, welfare and youth sets and so on. Enormous catalog value! 2142 ⊙ Federal Republic of Germany / BERLIN - 1948 / 89, extensive used collection in two lighthouse hingeless printed form albums with numerous different issues, older values, special- and commemorative sets and so on. Huge catalogue value! 2369 ⊙ Federal Republic of Germany / BERLIN - 1980 / 2003, nice and extensive special collection the coil stamp for vending machine, mainly perfect centric cancellation in the Lighthouse album accommodated, as well various issues and denomination value including high values, often with centered postmark from \"OBERTSHAUSEN\". A very nice object with enormous acquisition price! 2384 Federal Republic of Germany / BERLIN - very interesting and extensive inventory from mint never hinged postage stamp issues, almost exclusively complete corner margin block of four sets from Heuss medallion to sights, all in glassine-bags packed in the box, enormous amount of material, many uniform corner margin block of four sets, also a number of corner margin set in blocks of four Berlin woman and so on. Huge catalogue value respectively retail price!